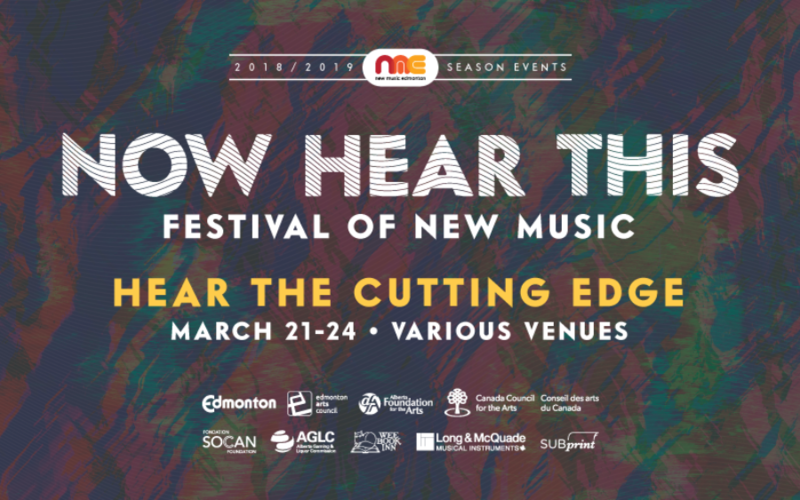 This will be New Music Edmonton’s 8th annual festival, and we have a lot of phenomenal sound-oriented creativity to ring in spring 2019. Want to play a pivotal role? Consider volunteering! We are thrilled to be welcoming recorder player Terri Hron back to her hometown Edmonton. Nesting is the very definition of “multidisciplinary,” featuring compositions by Terry and others, video, choreography and electronics. Inspired by experiences on Île Audet, the works comprising Nesting highlight different physical and emotional connections to the environment, to our stewardship of it and the inspiration it brings. One Canada’s most important interpreters of new vocal music will be coming to visit Edmonton from Regina for a special performance of Love Songs, by renowned Canadian composer Ana Sokolovic. The wonders of Helen Pridmore’s voice combined with this compelling composition, staging and lighting, will be unforgettable. Comprised of performers from Winnipeg, Saskatoon and Edmonton, this very special performance will bring together two members of the band Civvie – Kelly Ruth (Edmonton) and Natanielle Felicitas (Winnipeg) with respectfulchild, (Saskatoon) and Ethan Bokma (Edmonton). This fantastic combination of violin, ‘cello, bass clarinet and amplified weaving loom will be a brilliant celebration of Prairie creatives and not to be missed! To cap this event off, Civvie and Friends will be joined by Helen Pridmore in an improvised performance created especially for Now Hear This. Visiting us from Montréal, Katelyn Clark is bringing us the Edmonton premiere of her full-length solo show, Song of Sibyls. This unique, intermedia work is designed as a live performance for organetto, sound processing, and video. This is an improvised piece, with sound performed and created by Katelyn Clark, with video by Marlaina Read. Something cool and usually quite loud always happens when Edmonton-raised saxophonist Erin Rogers returns to town with one or more of her partners-in-crime. This time it’s Hypercube, a New York-based group comprised of saxophones, guitar, accordion and drums with works by Eric Wubbels, Erin Rogers, and Chaya Czernowin. UltraViolet presents a show featuring the world premieres of 3 works by Evelin Ramon, Anna Pidgorna, and Monica Pearce, addressing issues of social media and reality, traveling, and mourning. This concert is made possible by the support of a grant from the Canada Council for the Arts. Two new mothers, Jenna Turner (violin) and Caitlin Richards (viola), respond to their babies and create a lullaby in two parts, improvised over a collage of their daughters’ voices. In Gwendolyn Suite, a breast pump echoes, and violin, viola and other sounds soothe the harsh cries of a newborn overwhelmed by the world out of utero. Annalisa Suite begins in pregnancy where a mother sings to connect with her baby, then in labour through fetal distress. Get ready to groove with this pairing as Bhuyash Neupane and Matt Meeker of Holy Drone Travellers come together with Mustafah Rafiq. Trombone, guitar, tablas, voice and more all come into play in a compelling hybrid of drones, jazz, Indian classical and new music. These artists are emerging through this grouping and many others as among the truly compelling and influential forces in the Edmonton scene. Raylene Campbell is a sound artist who embraces various creative practices including improvisation, composition, performance art, sound and image, and Deep Listening. About Landing 23: Raylene takes the audience on an other-worldly journey through the desert using the tonal textures of accordion samples, field recordings, and the Therevox’s analog oscillators. Now in its third year, this free event, which sees some 2-dozen Edmonton musicians take over the City Hall atrium, is establishing itself as a trademark tradition in our festival. We are particularly excited to present a world premiere work, commissioned from Edmonton composer Emilie LeBel. Move around the space and hear the music from different perspectives, or just enjoy it from your seat – and don’t be surprised if Mayor Iveson shows up! This is definitely a 2-for for us. First, we are pleased to offer a work and performance by one of Edmonton’s great new music citizens, composer and performer Reinhard von Berg. Also, for only the second time in Now Hear This history we will be revving up the magnificent engine that is the Holy Trinity pipe organ. The von Berg composition, Visions, will make for an overwhelming experience, filling Holy Trinity with a massive, densely detailed pool of sound. This is a first performance by this outstanding duo and also the premiere of Ryan M. Hemphill’s Duet for Electric Guitar and Electric Bass. This innovative piece explores the hidden, normally suppressed microtonal voices of the instruments through performance techniques that utilize all string divisions in combination with each other. The use of contact microphones installed on the headstock will bring out an astonishing variety of sounds. This is guitar and bass as you’ve never heard them before! Kids Hear This will be a lively and fun opportunity to learn about musical instruments and the many avant-garde, noisy noises they can make! The musicians will include Beth Levia (oboe), Don Ross (clarinet), Terri Hron (recorder) and Helen Pridmore (voice)! It will be like a musical instrument petting zoo with an avant-garde focus. We’ll finish up with an all-in play-along improv. All materials will be provided by New Music Edmonton. Your hosts for Kids Hear This will be Ainsley Hilliard and Jezebel! NME is proud to offer this concert for free in recognition of the challenges families may face in being able to afford kid-friendly entertainment. A festival should be more than just concerts, and New Music Edmonton hopes you’ll join us in our free NME Sound Lounge during our two-day stint at Holy Trinity Anglican Church. We’ll be turning the Upper Hall of Holy Trinity into a relaxing space to socialize, have some refreshments, peruse scores and recordings, and even sit down with some art supplies to make a picture. We’ll be making an awesome playlist as accompaniment, with tracks suggested by festival artists. We are pleased to bring Sonic Play School to Now Hear This. This free series, created in partnership with McLuhan House, offers a safe, welcoming, non-judgemental space for adults to come and try their hand at playing with sound. In this edition, we are pleased to welcome composer and sound artist Scott Smallwood, who will lead the group in some free improvisation exercises using found objects. Bring your own, or just bring yourself – we’ll have lots of stuff on hand!